In 2017, you could travel to space for approximately £105,270. Not exactly chicken feed, but it's a price that is constantly being revised down as competition increases to build affordable commercial spacecraft and spacecraft paraphernalia. This is the cumulative figure of a number of crowdfunded space projects of all the equipment required for a booze cruise in space. Most people won't have £105,270 but as the trade becomes more popular and more projects become funded via crowdfunding, private investment or government schemes, a price war will break out. Space exploration has been traditionally, and almost exclusively, the remit of respective governments since the 1950s. Indeed, the 20th century's Space Race was a Mr Universe-esq flexing of governmental muscle between two cold-warring superpowers. But since Neil Armstrong's iconic words as he first set foot on the moon, very little has happened in terms of commercial space travel. Commentators and scientists at the time predicted that we'd be buying holiday timeshares on the moon by now, but after various failed projects to establish more of a presence on the great white rock, we've remained at a relatively infantile stage. Until now, that is. 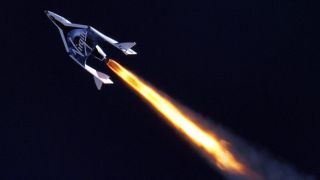 The personal ambition of scientists and engineers who are not connected to any government organization, combined with crowdfunding websites like Kickstarter and millions of enthused backers, means that a very different, more collaborative, type of space race is emerging. If you want the full, comprehensive, space travel experience - which includes a spacesuit, spacecraft and control of a satellite to tweet about what you're doing - then you're going to need a few tools. Here's a cost and timeline breakdown of what you'll need from the crowdfunding options. Probably the most important piece of the puzzle, because without it you'll just be a guy in a spacesuit standing in a field looking up at the sky. The Hermes Spacecraft, a recently funded Kickstarter project, is a suborbital space vehicle, which is being designed by STAR Systems. It incorporates a Space Shuttle-like flight profile which will take passengers to the cusp of outer space. The prototype is currently being developed and it is expected to start flying customers within the next four years. Mark Loganbach, CEO of STAR systems told TechRadar, "Our initial price per seat will be $150,000. This is a revolutionary price to take a once-in-a-lifetime adventure where only a few hundred people have ever gone before! "Our affordability comes from combining 40 years of NASA's lessons learned, designing and fabricating all of our parts in-house and creating a modular propulsion system to increase reliability while decreasing research costs." One of the world's first suborbital spacesuits for use and purchase by the general public has been designed by Ted Southern of Final Frontier Design. The spacesuit itself - called the 3G spacesuit - is NASA certification standard and is intended for "Intra Vehicular Activity: that is, launch and re-entry for commercial space providers both suborbital and orbital". Ted continues: "The future commercial space industry will need these suits for the basic safety of manned flights. Current NASA suits cost well into the millions, while our 3G is intended to retail for a small fraction of this." The suit recently received full funding on Kickstarter and Ted expects it to be available for purchase this year at a price of $10,000. Could you be buying one of these this year? Before you set off you can take some teaser images of what you'll be looking at from space with the SkyCube satellite. SkyCube is a 10x10x10 centimeter CubeSat (cube satellite) due for launch in April 2013 on a SpaceX Falcon 9 rocket from Cape Canaveral, Florida. It will be one of (if not the) first crowdfunded satellite in space, and will take panoramic, wide-field images of the Earth, broadcast a sponsor's message as 'a tweet from space' in orbit, and when the mission is done, it will deliberately de-orbit itself by inflating an onboard balloon.